Holding Library: The specific library to which borrowed material belongs AKA Owning Library (when not the Home Library). Home Library: The library with which the patron is affiliated. "Home Library" refers to the institution rather than a specific library. For example, University of North Georgia UNG) patrons are affiliated with the UNG Libraries as a whole, not an individual library on a particular campus. Visited Library: Any USG library other than the patron's Home Library. This could be for pickup, returns, or walk-up. The GIL-FIND Catalog:A single, unified database containing the holdings of all university System of Georgia Libraries. It has real time links to holdings and item information. Items that do not circulate through GIL Express are included. These items may be available for in-library use at the Holding Library..
GIL Express: A resource sharing service offered at all libraries within the University System of Georgia (USG). This service provides access to all eligible circulating material at USG libraries. GIL Express is available to all eligible patrons through remote requesting in the GIL-Find catalog as well as an on-site (walk-up) service. Eligibility: All currently enrolled students and currently employed faculty and staff in good standing at their Home Library are eligible to use GIL Express. Retired faculty and staff should check with their Home Library to determine if they are eligible to use this service. Scope: Printed books (monographs) with the standard loan period at the Holding Library are available to be borrowed through GIL Express. 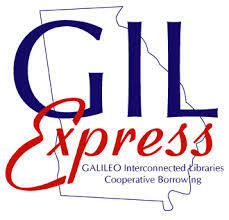 Borrowing materials not available through GIL Express: Items not circulated through GIL Express (i.e., journal articles) may be available through Interlibrary Loan (ILL). Please contact the Home Library’s ILL Department to determine eligibility. Loan Period: GIL Express has a 28-day loan period for all patrons. Two automatic renewals are given unless the material has been recalled. Recall Fines: If a USG library chooses to charge recall fines for GIL Express materials, the fines will be $2.50 a day for each recalled item. Recall fines apply to all patrons. Statewide vs. Local Policies: All USG Libraries have agreed upon most of the policies that govern GIL Express. However, some policies, such as the number of items that may be borrowed from a specific institution, are set locally. This means that the Holding Library (the library that owns the material) and the Home Library (patron’s library) have control of certain policies. These local policies are available from each library, usually on the library's web page. To make a request, you must sign into your library account. You can do this from the GIL Find home page, before you search for a book. If the book being searched for is not available at the Home Library, check the “More USG Libraries/GIL Express Request” field for other USG libraries where the book might be available. 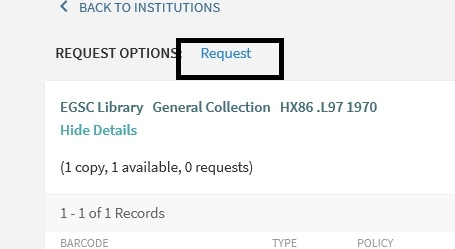 When you are ready to make a GIL Express request, select an institution where the book is available by clicking the green "Available" link (see above). The book details will display, then select "Request". The owning library is displayed as the Pickup Institution by default. Change the Pickup Institution field and the Pickup LIbrary field to the institutuion and library where you want the book delivered. Then, click "Request" to submit. On-Site Requesting: Eligible patrons can go to any USG library and borrow books. When checking out the item(s), patrons are required to provide proper ID to determine their eligibility to use GIL Express. Required Identification: An institution-issued picture ID that is current and valid is preferred. A current and valid government-issued picture ID, such as a driver's license or a Georgia ID card, a US passport or a US military ID is also acceptable. If unable to verify eligibility, the Holding Library’s staff may call the Home Library to verify the patron’s eligibility. Viewing GIL Express Requests/Loans: You can see material requested or check out both from the Home Library and GIL Express in "My Account" through the GIL-Find catalog. Go to the FIL-Find catalog and click on "Guest" on the top right of the screen. Sign in using the appropriate method for the home institution. After signing in, click on the “My Library Account” tabThis takes you tot he overview page to view requests and loans from the Home Library and other account information. To check loans and requests from other libraries, click on the down arrow (see below). The USG libraries will be listed in alphabetical order. To see books requested and checked out through GIL Express, select the USGlibrary the books were requested and/or borrowed from.